Compared to the big, bustling Esri User Conference—which draws about 18,000 attendees annually to San Diego, California, to talk about all things GIS—the Geodesign Summit is a small, understated affair. This year, about 225 people from 18 countries congregated at Esri headquarters in Redlands, California. Every winter, attendees share their geodesign projects and learn about geodesign concepts, methods, and technology. 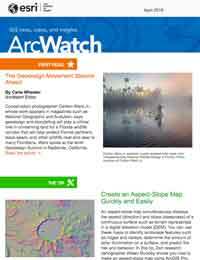 While some commonalities exist between geodesign and GIS, there are differences, too. Geodesign combines the art of design, the science of geography (e.g., spatial analysis), and input from stakeholders to find the most suitable, sustainable, and environmentally friendly ways to use space. That may be space for wildlife conservation, agriculture, development, transportation, or marine protected areas, to name a few examples. Esri president Jack Dangermond, who earned a master’s degree in landscape architecture from Harvard University Graduate School of Design, has been a strong proponent of geodesign for years, helping to organize the first Geodesign Summit in 2009. In marking the event’s tenth anniversary, Dangermond said that the practice is finally taking root in academia, urban planning, conservation, some parts of government, and other areas. 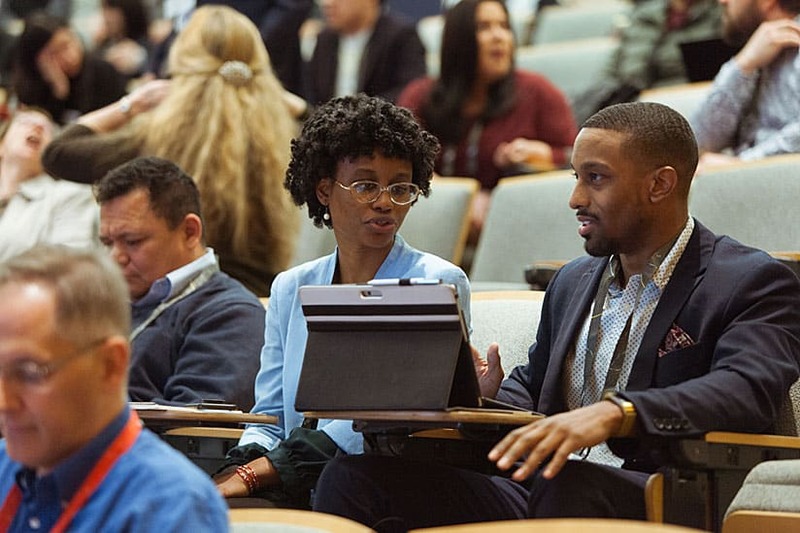 “This idea of geodesign is becoming a movement, [though] it’s subtle and in the background,” he said at the opening of the 2019 Geodesign Summit, which was held February 25–27. According to Dangermond, geodesign is part and parcel of the digital transformation, which includes big data, artificial intelligence, the Internet of Things (IoT), and Web GIS. 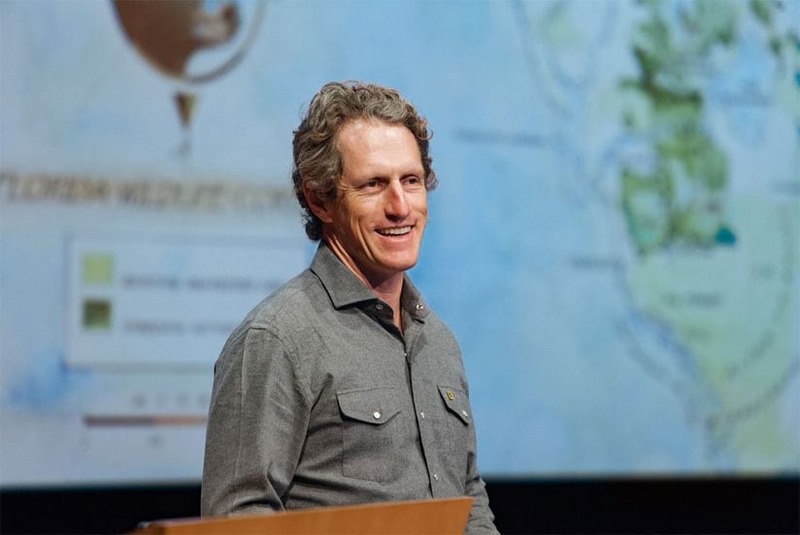 He urged the audience members—many of whom were design or GIS professionals—to use their creative and technical talents to take on big issues like climate change, sustainable development, and conservation, especially as the world population grows and resources become strained. 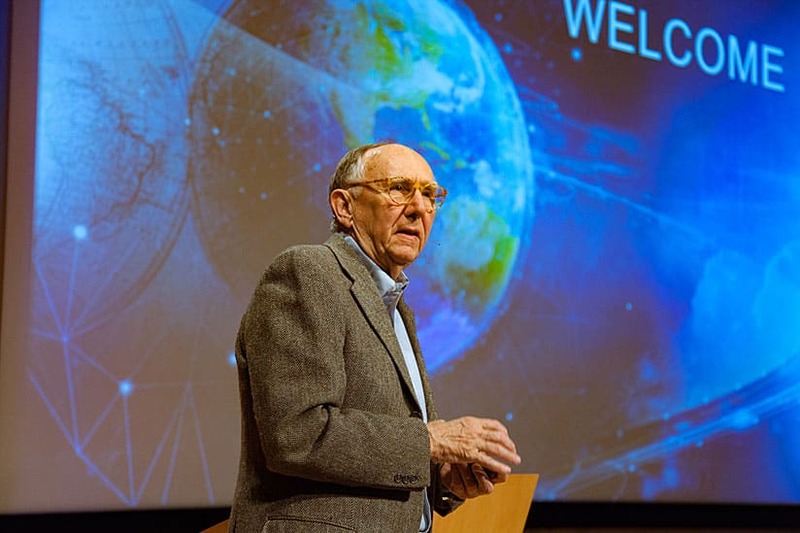 Esri president Jack Dangermond wants people to adopt geodesign practices and technology to make the world a more sustainable place. Geodesign Summit attendees are encouraged to exchange ideas with each other and ask the presenters questions about their work. 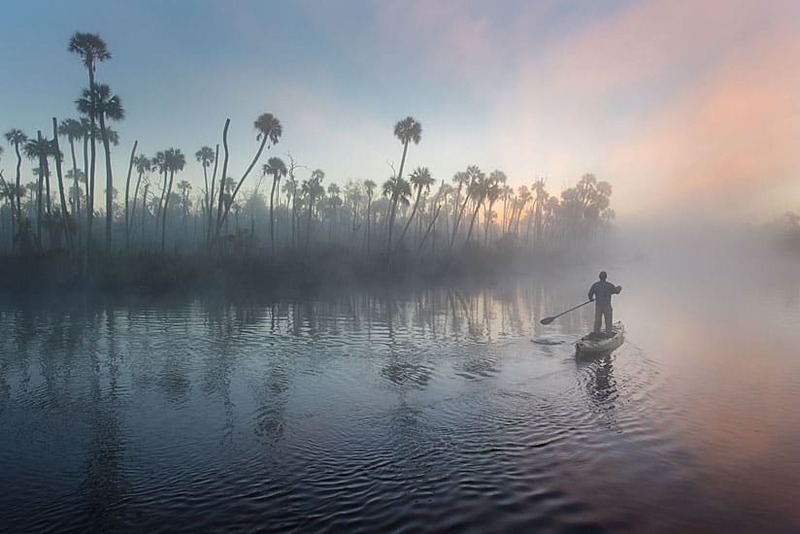 One person who is making a big difference in efforts to protect and connect natural habitats in Florida is Carlton Ward Jr., an eighth-generation Floridian and conservation photographer whose work has been published in magazines such as National Geographic, Smithsonian, and Audubon. Ward founded Florida Wildlife Corridor, an organization that aims to protect, connect, and restore land and waterways that have been identified as conservation priorities is a green infrastructure network throughout Florida. 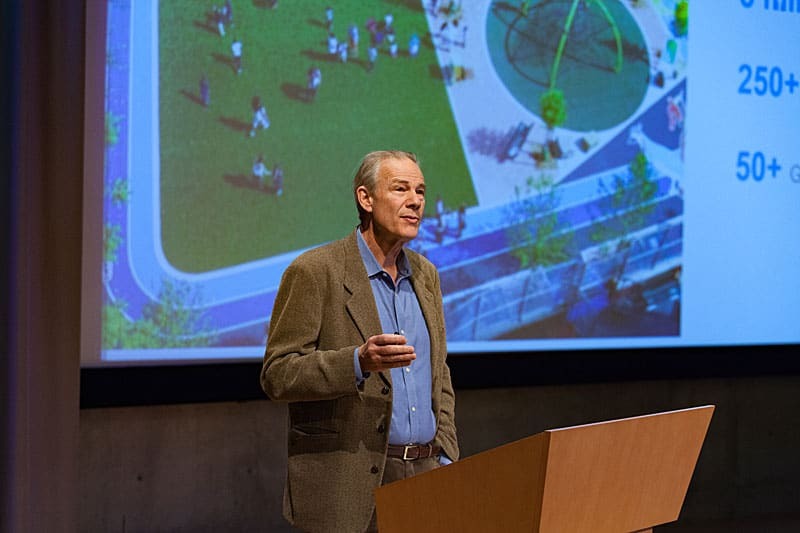 In his Keynote Address at the Geodesign Summit, Ward talked about his work. He uses photographs, videos, and maps to tell stories about what he calls “wild Florida,” the ever-shrinking habitant for animals like the Florida panther, black bear, bobcat, alligators, and birds such as cormorants. Carlton Ward Jr. talked about the wildlife he photographed in Gabon, Africa, and his home state of Florida. Ward comes from a family of cattle ranchers and politicians. His great-grandfather, Doyle E. Carlton, was Florida’s twenty-fifth governor, and his family’s cattle ranch serves as a habitat for panthers and other wildlife. But rather than go into ranching or politics, Ward became a conservation photographer. He traveled to Gabon, Africa, to study biological diversity and photograph 400 different species of plants and animals including tree frogs, lizards, and sand snakes. (See “Portraits in the Wild” in Smithsonian.) “Working in Gabon gave me an appreciation for intact wilderness,” he said. Eventually, however, wild Florida drew him home. Ward, who has a master’s degree in ecology, has kayaked, hiked, and ridden horses during two 1,000-mile expeditions throughout the state, all the while photographing the wildlife that roam and the people who work the land that he holds dear. Ward has captured spellbinding photographs of panthers and black bears as they travel through protected areas, cattle ranches, orange groves, or other nondeveloped private and public lands. “I can help the panther take his own picture,” said Ward. He played a video of how he sets up the camera traps and then leaves his equipment behind in remote places where weather conditions can turn challenging, like when a hurricane hits. A male Florida panther travels through an oak hammock at the edge of a cypress strand at Babcock Ranch State Preserve near Ft. Myers. The first female panther documented north of the Caloosahatchee River since 1973 was tracked to a nearby trail by state biologists in November 2016 giving new hope for the recovery of the species. Photo courtesy of Carlton Ward Jr.
During his presentation, Ward also displayed a map that traced the 500-mile journey of a bear named M34—fitted with a GPS tracking collar—through south-central Florida over a two-month period. Ward said the bear was able to travel so far with the help of a network of working farms and ranches that keep the public lands connected, though the animal was ultimately stopped and turned around by Interstate 4 and the big housing developments nearby. 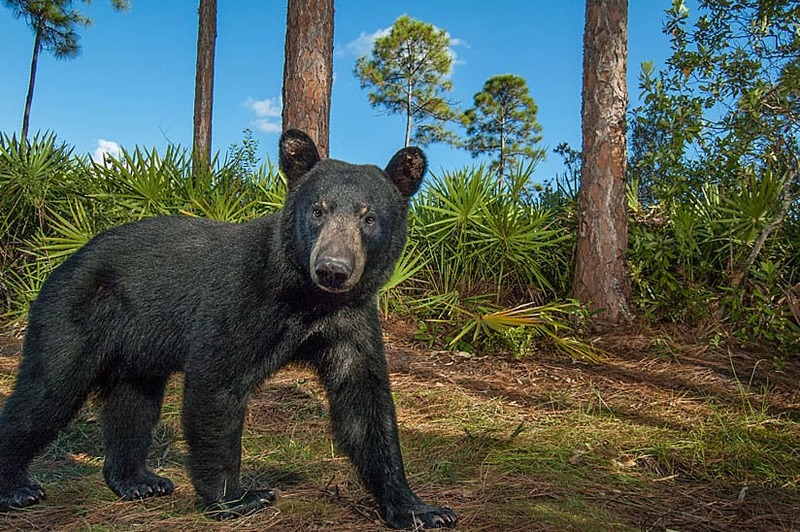 A black bear triggers a remote camera among Central Florida palmettos and pines. Once abundant throughout the state, black bears now survive in seven increasingly isolated sub-populations. Protecting corridors can help reconnect them. Photo courtesy of Carlton Ward Jr. According to Ward, Florida’s population of about 21 million increases by about 1,000 people a day, net. Housing for these new arrivals often gobbles up land. Ward said that his organization’s goal is to help grow his state’s wildlife corridors and keep these areas intact so that wildlife can move about, unhindered and unhurt. Endangered panthers have been struck and killed by vehicles—one of the latest incidents occurred in Collier County in February. About 30 were killed in 2018. On the brighter side, wildlife crossings have been built under some highways, allowing animals like the panthers and black bears to avoid the threat of cars and trucks. 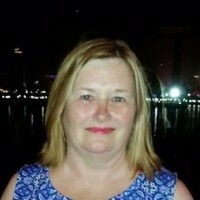 And in November 2016, Ward said a female panther traveled to an area north of Caloosahatchee River—an event that had not been documented since the early 1970s. This discovery showed a northward expansion of the panthers’ breeding habitat. 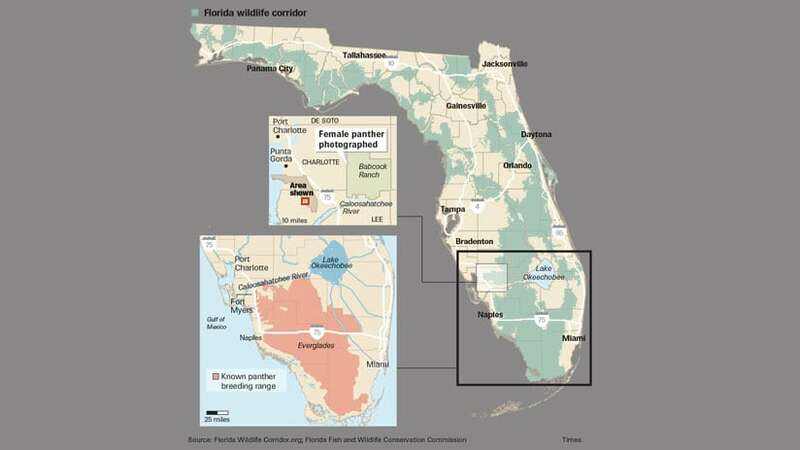 Florida panthers mainly roam the southwestern part of the state but have been recently spotted north of the Caloosahatchee River. In a panel discussion after his talk, Ward told Dangermond and members of the audience that using imagery and a GIS framework can guide conservation stakeholders as they continue to expand the wildlife corridor. 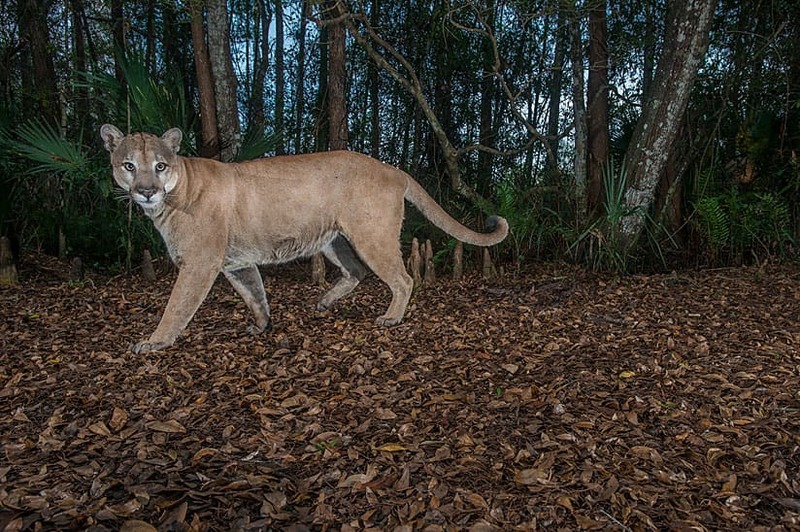 Ward is currently working on a conservation photography project called Path of the Panther; donations collected for the project help elevate the story of the Florida panther and critical habitat needed to help save wild Florida. Time is short, according to Ward. Currently about nine million acres of the Florida Wildlife Corridor are protected, and there’s an opportunity to conserve nearly seven million additional acres. “If we don’t take action in the next decade, we are going to have some irreversible [environmental] damage,” he said. 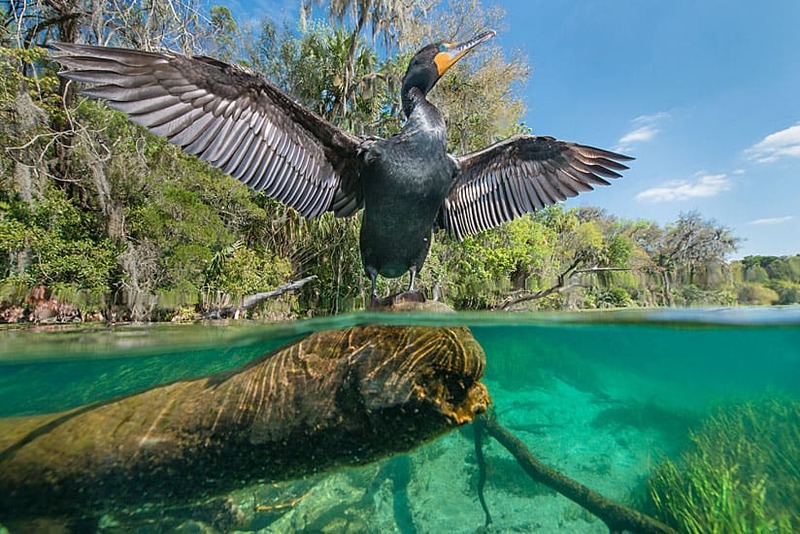 A double-crested cormorant spreads its wings from the perch of a submerged sabal palm in the Rainbow River, which flows 5.7 miles from its headspring in Rainbow River State Park to a confluence with the Withlacoochee River along Florida’s Gulf coast. . Because cormorants log a lot of dive time while hunting for fish beneath the surface, they are often seen standing in the sun drying their feathers. Photo courtesy of Carlton Ward Jr.
Maps are an important aspect of communicating the need to add land to the Florida Wildlife Corridor, according to Ward. During the 2015 Glades to Gulf Florida Wildlife Corridor Expedition, Carlton Ward Jr explored a palm-studded tidal creek near Chassahowitzka National Wildlife Refuge. Photo courtesy of Carlton Ward Jr. Dozens of presenters at the three-day Geodesign Summit shared compelling stories of how they use geodesign and maps to make better-informed decisions, often about land use. Among the presenters was Devin J. Lavigne, a principal and cofounder of the consulting firm Houseal Lavigne Associates, which specializes in urban design, community planning, and economic development. He showed how Houseal Lavigne Associates is using Esri’s community engagement software ArcGIS Hub and one of Esri’s data collection solutions, Survey123 for ArcGIS, to gather feedback about El Paso County, Colorado’s master plan from the local residents. 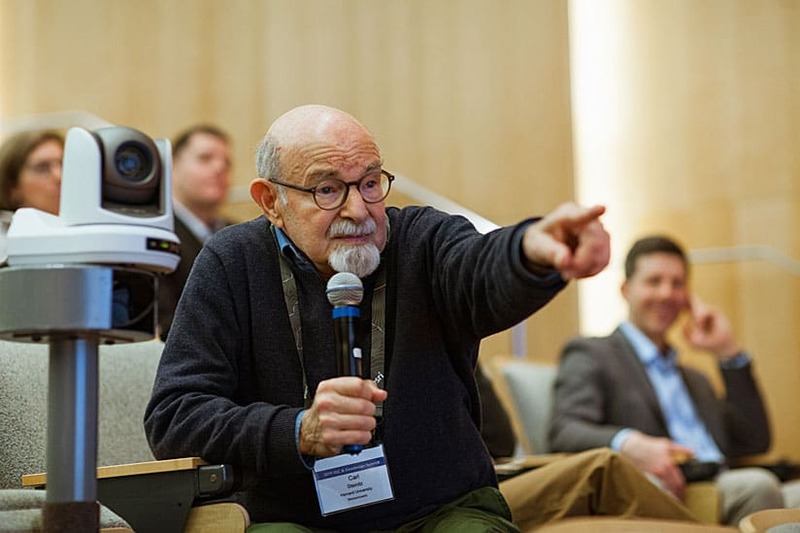 Getting input from project shareholders—whom Carl Steinitz, author of the book A Framework for Geodesign: Changing Geography by Design, calls “the people of the place”—is critical in the geodesign process. Carl Steintz makes a point at the Geodesign Summit. Ken Schmidt, GIS administrator at the City and County of Honolulu, Hawaii, talked about applying geodesign with ArcGIS Urban. While the software is still in development by Esri, it is being put through its paces by several early adopters. Honolulu is using it to analyze how local zoning changes could create opportunities for additional housing in an already highly urbanized area. Schmidt demonstrated what impact adding five-story walk-up apartments in the Moiliili neighborhood would have, compared to the currently permitted three-story walk-ups. ArcGIS Urban, which was demonstrated at the Geodesign Summit and will be released this summer, is a web-based GIS solution designed for urban planners. It lets them visualize a digital twin of their community; all their citywide plans and projects are in one place. 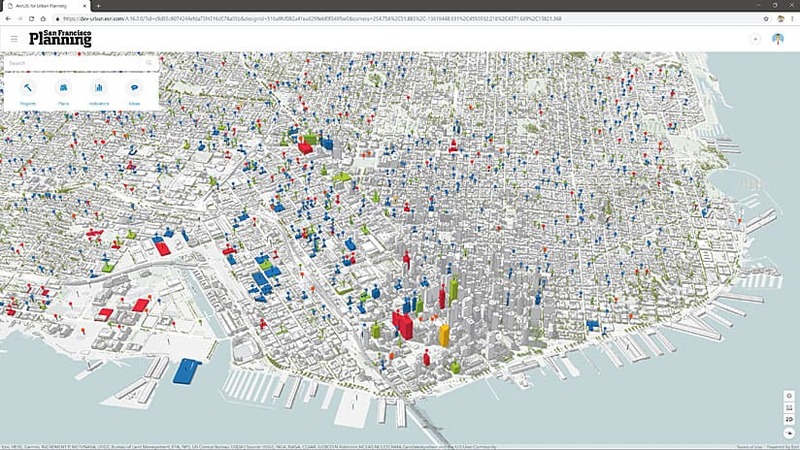 With ArcGIS Urban, they can create, manage, and share plans; visualize current projects; see zoning regulations in 3D; compare design scenarios; analyze the impact of their plans based on a set of built-in indicators; and engage with the public. The interface offers a comments section, giving stakeholders—whether they’re the planners’ colleagues or members of the public—the ability to share ideas about or otherwise weigh in on the plan. Colleagues can collaborate on projects with ArcGIS Urban. And Jerry Blum, countywide plan coordinator for the County of San Bernardino, explained how his agency created a database-driven, web-based countywide plan. He said the county switched from paper to web maps for creating and sharing general plan information internally and externally. The county used Esri technology for this project, including Web AppBuilder for ArcGIS, ArcGIS Online, and Esri Story Maps apps. For example, this land-use map and this parks and open space resources map on the county’s website were created using Web AppBuilder. Blum said that during public meetings, staff used tablets to show people story maps that explained elements of the draft plan. The mission statement of The Trust for Public Land (TPL) emphasizes creating parks and protecting land for the people rather than protecting land and nature from the people, according to Will Rogers Jr., president emeritus of TPL. Since 1972, the nonprofit organization has worked on projects that have set aside more than 3.3 million acres for protection throughout the United States, and TPL has finished more than 5,400 parks and other conservation-related projects. Will Rogers Jr. said maps are key to making decisions about where to place parks and conserve land. TPL’s tools quickly became more advanced. For example, the organization could use GIS and demographic data to find out where parks are needed and who did not have access to them, Rogers said. TPL found out that two-thirds of the children living in the city of Los Angeles were not living within a 10-minute walk (a half-mile radius) from a park. TPL used GIS to help develop the ParkScore ranking system to evaluate how well cities are doing in providing easy access, amenities, acreage, and investment in parks for its residents. Currently, Los Angeles has a ParkScore ranking of 66 out of 100 large American cities, while Minneapolis, Minnesota, ranks number one. TPL uses GIS to find the best locations for urban parks. Rogers also pointed to the Green Alleys project as an example of how organizations such as TPL can increase access to green spaces. Working with a decision support tool that uses Esri ArcGIS technology and factoring in other information and community input, TPL identifies areas that would benefit from green alleys. 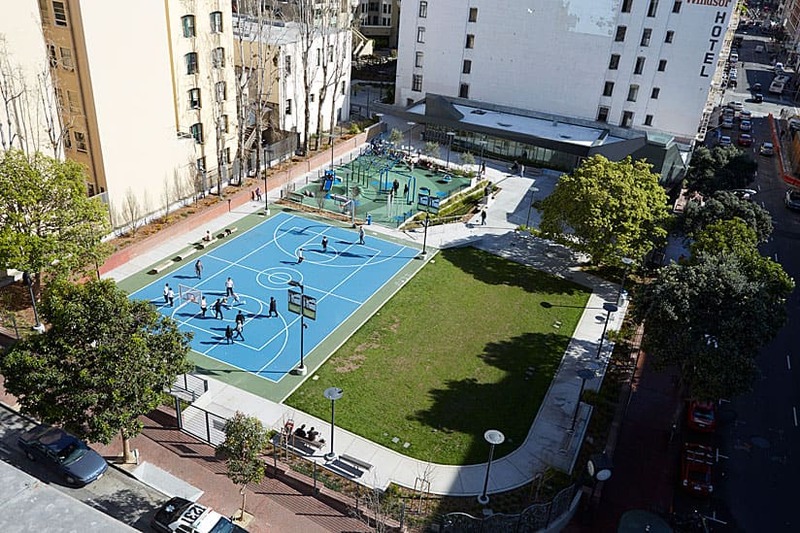 Many factors go into selecting which alleys would be good candidates for these green spaces, including social vulnerability and environmental quality. For example, one alley in the Avalon neighborhood of Los Angeles was spruced up with greenery, and its impervious surface was removed and replaced with pavement that reflects light and is more permeable. This helps to keep the alleys cooler and reduce the runoff of water into storm drains. 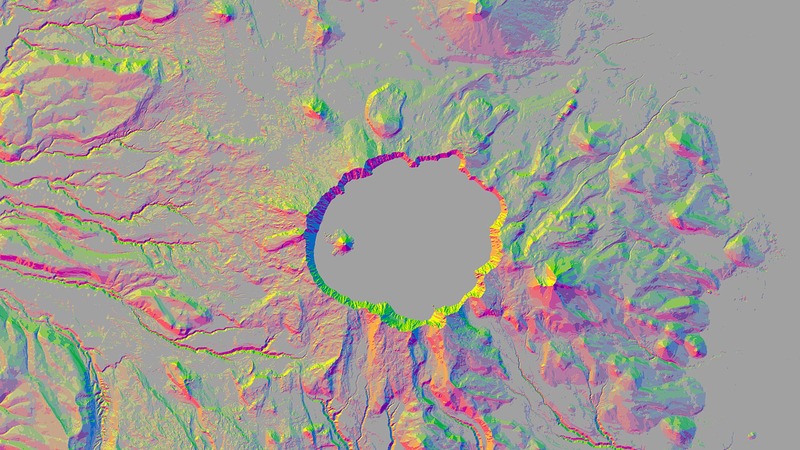 “None of this would have been possible without GIS and geodesign,” Rogers said. The next Geodesign Summit will be held February 24-27, 2020. It will be preceded by the International Geodesign Collaboration (IGC), which is slated for February 22-24, 2020. Both events will be held at Esri headquarters in Redlands, California.